Abstract: "Under current law, national health expenditures are projected to grow at an average annual rate of 5.6 percent for 2016–25 and represent 19.9 percent of gross domestic product by 2025. 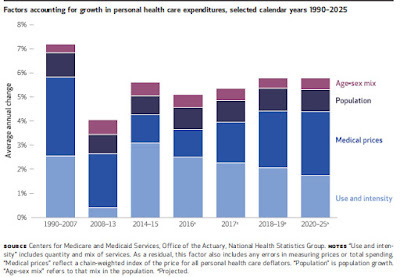 For 2016, national health expenditure growth is anticipated to have slowed 1.1 percentage points to 4.8 percent, as a result of slower Medicaid and prescription drug spending growth. For the rest of the projection period, faster projected growth in medical prices is partly offset by slower projected growth in the use and intensity of medical goods and services, relative to that observed in 2014–16 associated with the Affordable Care Act coverage expansions. The insured share of the population is projected to increase from 90.9 percent in 2015 to 91.5 percent by 2025."